Man, 1994 was a great time to be a Star Trek fan. 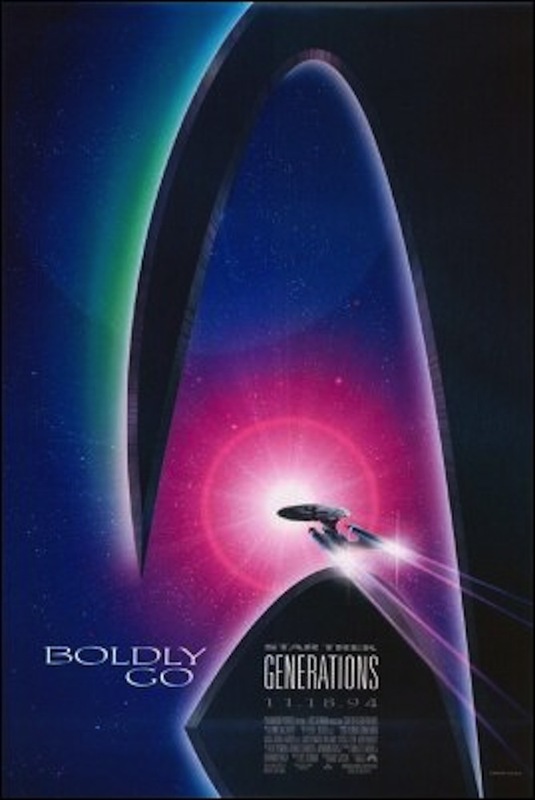 In immediate output, the year saw Star Trek: The Next Generation completing its seven season run in syndication in May, Star Trek: Deep Space Nine settling in to a steady run in syndication – finishing its second season and going right on to its third, Star Trek: Voyager beginning filming that October and set to debut in January 1995 on the new United Paramount Network, and Star Trek Generations, a new film uniting select crew members from the Original Series and the entire crew of The Next Generation, set to hit movie theaters on November 18. And now here we are twenty years later, and Generations will be a 20 year old movie on next Tuesday. As Picard mournfully says in the film, “time is the fire in which we burn.” But I don’t think it’s that somber of an anniversary – at least, I hope not! Looking back, this was the event movie of the season for me, as an impressionable 10 year old and recently minted TNG fan. I talked my mom, who wasn’t the fan – parent, into attending an opening afternoon showing at the Loews in Danvers, and am sure I also talked up my anticipation throughout that week of 5th grade, so much so that one of my two homeroom teachers continued to ask me about Star Trek topics for a few years afterwards, and probably would clearly remember it if I brought the subject up to her today. My dad, the fan – parent, and I caught an encore viewing of the film a month later at the then – new General Cinema in Burlington, which would be a frequent filmgoing site for us over the next couple of years. I’d love to see any written thoughts I might have expressed about that first screening on the opening afternoon. I do recall feeling some disappointment at the downbeat nature of the story, such as Captain Picard being an emotional wreck rather than a fearless leader for the majority of the movie. I certainly enjoyed Data’s increased presence in the storyline, as he decided to finally jump into a world with emotions, and even experiment with swearing! The film enjoyed a solid critical and commercial reception, ultimately grossing around $75 million in grosses. I recall that its video release came on my birthday in 1995, eight months after its cinema release. The film was allegedly the first to ever feature a website as a key promotional tool. 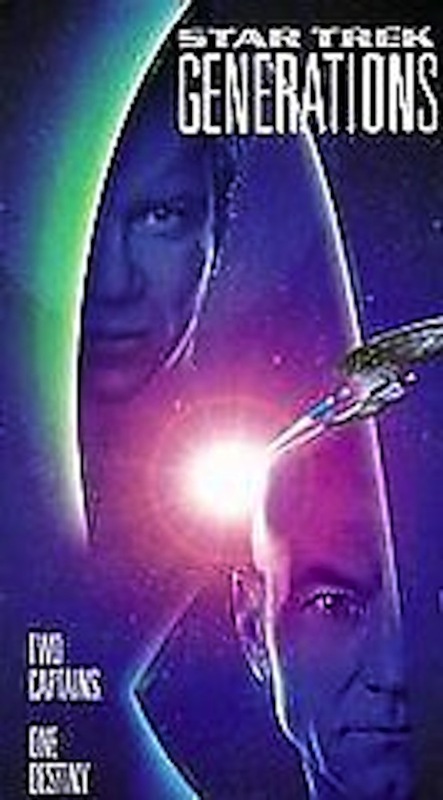 Especially considering it was followed two years later by First Contact, the Next Generation crew’s finest cinematic hour, this film did not age well on multiple fronts. The writers voiced their retrospective opinions in a revealing interview that appeared on the internet earlier this year. Other TNG actors have noted the intensity of 1994 and the mixed blessing of finishing their series and going right on to the movie. So Generations clearly has a place in Star Trek history, but it is remembered with mixed emotions by those involved – and perhaps by other fans who were eager to see it on the big screen but then not matched in their expectations to boldly go where no one has gone before. Posted on November 14, 2014, in Movies and tagged boston, brent spiner, gates mcfadden, gene roddenberry, general cinema, jonathan frakes, levar burton, majel barrett, malcolm mcdowell, marina sirtis, michael dorn, north shore of massachusetts, patrick stewart, rick berman, science fiction, star trek, star trek movies, star trek: the next generation, uss enterprise, whoopi goldberg, william shatner. Bookmark the permalink. 2 Comments. This made me miss Star Trek TV shows. What a great time to be a kid. One assumed Star Trek would ALWAYS be on TV in some form or other. Might have to go back and do some re-watching now. I totally agree! One of the TV stations in Boston even had a “Star Trek Hotline” at the time (where it was pre – internet). Viewers could call in for a list of what shows from what series would be on that week, and also get info on any upcoming conventions.